Crab meat reminds me of trips down the shore (that’s the beach, in New Jersey “slang”) with my family, sitting on the edge of my Uncle’s dock, waiting for my string to move, signaling that a crab had bit the bait. It was so exciting to hook that crab and pull it up, screaming with my cousins and my brother and sister. We were afraid of the prickly looking crustacean, but so ecstatic that we caught one. My mother would cook the crabs right away and we’d all use our fingers to eat them later that night. I’ll never forget the one time that a crab got loose and crawled into some random crevice in the house. I couldn’t sleep that night. I remember laying with my eyes open for the entire night, listening to every creak, jolting up and looking around to make sure that crab wasn’t coming for me. It never got me, but it sure was a close call. The simple smell of crab reminds me of these childhood memories. I try to incorporate crab into meals when I can, but unfortunately, crab meat can be on the pricey side. If you are using crab meat for dinner, just make sure you have another use for that crab meat, so it doesn’t go to waste (especially if you typically only cook for yourself or one other person.) I love making English muffin crab melts and crab cakes and freezing them. 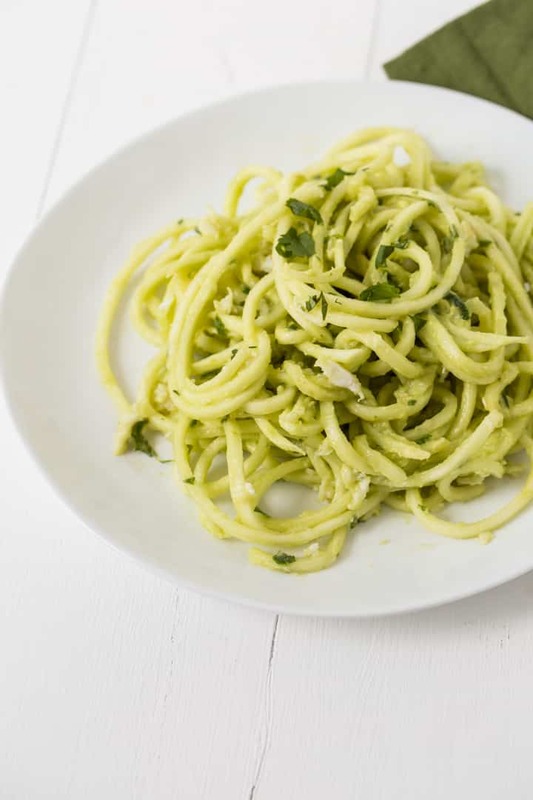 Other than that, every once in a while, I love to splurge on quality jumbo lump crab meat to make dishes like this zucchini pasta. Another favorite way of mine to eat crab with zucchini pasta is to cook the noodles in a sauce with olive, garlic and red pepper flakes and then toss in the crab meat, stir for a minute and serve, garnished with parsley or even a little fresh basil. This spicy avocado sauce is one of my go-tos in the summertime, when I don’t want to turn the stovetop on. Everything happens in a bowl, no heat required. 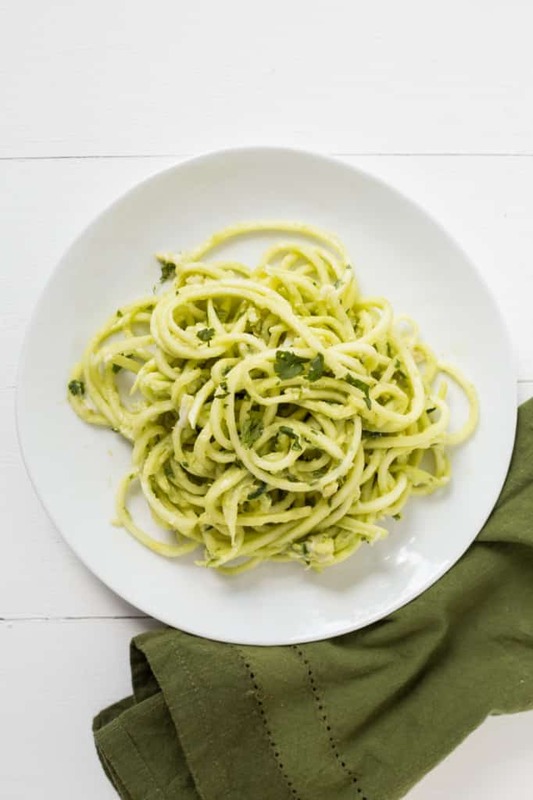 Also, you’ll notice that the zucchini noodles look especially like “real” spaghetti today. That’s because I peeled the zucchini! I rarely peel zucchini (I like the crunch and the nutrients from the skin), but I did with this recipe, because it works well with the creaminess of the avocado sauce. The consistency is light and lets the crab speak more loudly. Thanks for letting me reminisce with you today! Place all of the sauce ingredients into a food processor. Pulse until creamy. Taste and adjust if necessary. 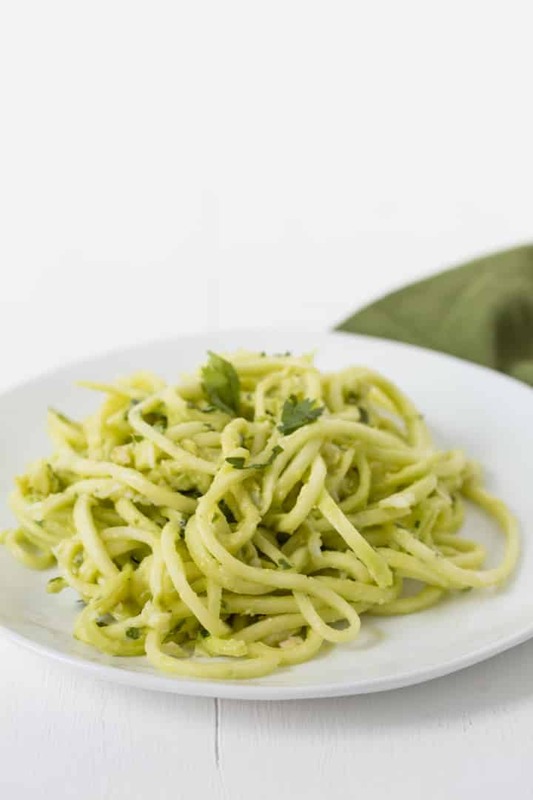 Place the zucchini noodles into a medium mixing bowl along with the avocado sauce and toss until combined. Add in the crab and toss again. Divide into bowls and garnish with cilantro. This recipe looks very yummy.. but I do not think grinder is a word. I think it should be ground..just me!! Technically, grinded is an acceptable word. While not as common as "ground", it is not incorrect. (I assume that's the word you are referring to, since no where is the word "grinder" used in this recipe. :) My family just had a crab feast this past weekend; I wish I had some leftover crab for this recipe! Looks really good! Really... what's with the grammar lessons? I don't think my enjoyment of this recipe will be any different if I choose to use grinded or ground sea salt. My goodness, give the girl a break. This recipe looks amazing!! Think it'll be lunch tomorrow. Thanks for another fantastic office lunch recipe!!! I agree, lay off the grammar comments. It's totally unnecessary and snarky! I live in Minnesota and crabmeat is super expensive here. Just wondering how many ounces of canned lump crabmeat would you use for this recipe? I don't think the grammar lesson had bad intentions so calm down folks... but it has me wondering. The term ground brings images of finely ground salt such as normal table salt to mind. "Grinded" salt invokes visions of sea salt sold in little grinder bottles which produces a course texture. Of course you can also place sea salt in your own grinder or purchase it in the desired end form. Any way I look at it, I think Ali was correct to guide us to a better "finishing salt" because this dish will not be cooked after it's addition. My mom loves crab so I'll be sending this recipe to her. Looks yummy. What do you do with the other half of the jalapeno? Did I miss that, I reread it a few times? *************** Reserve half of the jalapeno slices and place the rest into a food processor along with all of the other sauce ingredients. Are you going for a crunchy effect with the zucchini? 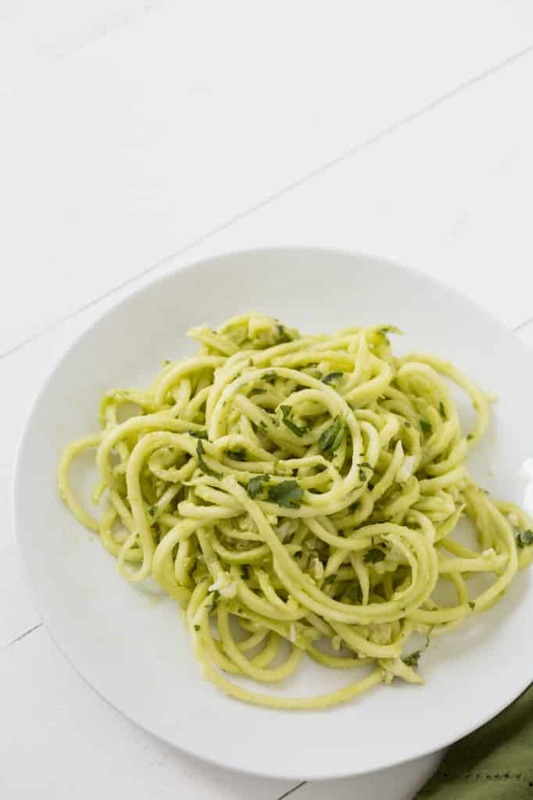 I'm having a tough time getting a limp, more 'noodley' quality to my zucchini noodles. I've tried salting them, but even with a lot of rinsing and patting dry, they are almost too salty to eat. Any suggestions? I think you should also post this in side dishes - I left out the crab and served it as a side dish with Salmon marinated in a teriyaki sauce and my family LOVED it - I mean LOVED it! I had the left overs the next day for lunch - adding some fresh zucchini spirals for crunch - fantastic. Are you going for a crunchy effect with the zucchini? I'm having a tough time getting a limp, more 'noodley' quality to my zucchini noodles. I've tried salting them, but even with a lot of rinsing and patting dry, they are almost too salty to eat. Any suggestions? This recipe looks absolutely yummy & I want to try it! Thanks for starting Inspiralized - it is great! Can you make ahead, combine the sauce and zucchini, refrigerate, and serve later? Or if making ahead, should you not combine the sauce with the zucchini until ready to serve? 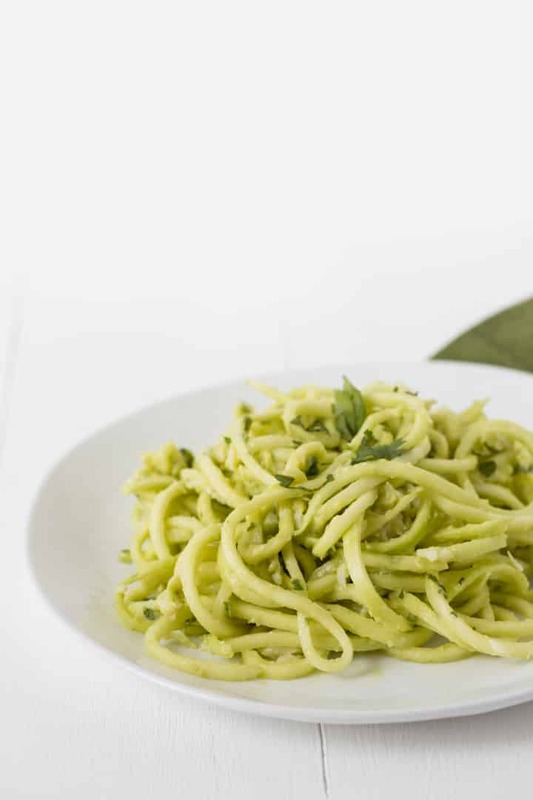 I always recommend preparing sauces separately, since zucchini noodles will release moisture over time! Do you think this would work with shrimp? I have some I need to use. Loved this recipe! I used crab claw meat and since I didn't have jalepeno - I used a tiny bit of chili powder. I then garnished with paprika -- and liked it so much I blended some in. The dash of red color it provided was appealing as well. The zucchini noodles did soften over an hour or so in fridge. They tasted/felt a lot more like pasta (fantastic) than unpeeled. I'll have to play around with "to peel or not to peel" with other recipes :) I may replace the crab with hard boiled egg (white) some time - I think would be great. Hi, just wondering how well does this keep in the fridge and for how long? Will avocado sauce start to get brown? Or sauce otherwise not taste as good? Thanks! Made this with spaghetti squash and chopped cooked zuicini So good! Added cherry tomatoes too for a little bit of sweetness. The spicy avacode sauce is AMAZING!